Now Voted in the Top Ten Local Classic Car Clubs in the UK by Practical Classics Magazine. Welcome to the official site of the South Wales Classic Car Club (SWCCC). The club was formed by a small group of enthusiasts back in 1983 and has taken a dynamic path to get to where we are today. We currently have a membership of around 100 classic car enthusiasts, mainly from South Wales, but with some as far away as Bristol to the east and Pembrokeshire to the west. The SWCCC represents a great opportunity to meet fellow old and modern classic enthusiasts and strike new enduring friendships, based on a common interest. We are a very diverse group and member's cars range from fairly modern Japanese sports cars, through 1960's and 70's British standards to vintage Rollers, with examples of a lot more in-between. 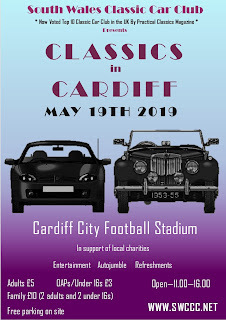 There are regular gatherings and organised runs throughout the year and our annual show, Classics in Cardiff, run entirely by volunteers from the club. The money raised enables donations to be made to various charities serving the South Wales area. Whilst all the above is certainly true we always look forward to meeting new classic car enthusiasts, because the ultimate survival of the club relies on a regular intake of new members.